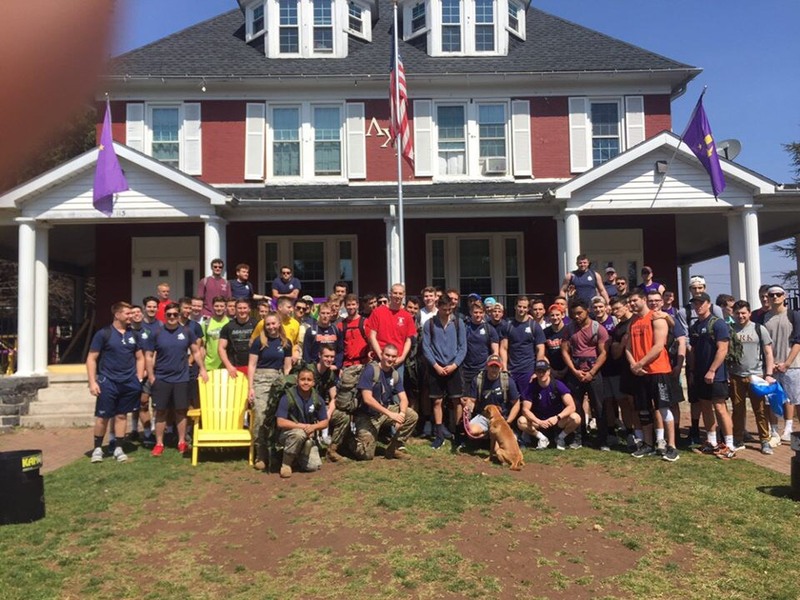 Lambda Chi Alpha Holds Third Annual Ruck March | The Gettysburgian. This past Saturday, April 6, Lambda Chi Alpha held its third annual Ruck March philanthropy event. The event was co-sponsored by Alpha Tau Omega, Phi Delta Theta, and Sigma Alpha Epsilon and featured 65 people running, walking, or even running with their dog the 2.4 miles. For the first time, a Lambda team won the event, taking home the $250 gift card. The team consisted of Caleb Parker ’19—who won the event overall with a time just under 15 minutes—Orrin Wilson ’20, Skyeler McCully ’19, Harrison Rottman ’20, and Christian Whitsel ’21. The SAE team came in second place led by Mike DeLeo ’19, who also ran with his dog, Belly, and came in third place overall. The Ruck March historically benefits an organization that helps retired or injured army veterans. This year, the event benefitted the TruBar Foundation, which is committed to building a Veteran’s Village to benefit homeless veterans. Many ROTC cadets also attended the march to show their support and the national anthem was played before runners took their marks. Parker set the pace out of the gate and was followed closely by several SAE members, including DeLeo and his dog. However, at the halfway point, Parker quickly pulled away from the pack and finished comfortably ahead of everyone else. “To both Lambda and I, it is important to help people who demonstrated their service and sacrifice and benefit our community as a whole,” said Kurtis Grey ’21, the Philanthropy Chair for Lambda, who is also a member of Gettysburg’s ROTC program. Grey stressed that doing philanthropy for the community also functions as a way of uniting the campus around a common cause. “Allowing a large portion of the Greek community to come together for a great cause is important because it allows for a better connection between Greek and non-Greek life, along with the organizations as a whole,” said Grey. Overall, the event raised over $1700 for the TruBar organization; Lambda is excited to run the event again next spring. Charlie Williamson '19 is the sports editor for The Gettysburgian. A psychology major, he is a psychology lab research assistant and a Student Senator representing the Class of 2019.